Tea & Ink Writing Club – We write, we chat, we drink tea! Our next meeting with special guest Catherine Young, author & poet, was unparalleled. We Skyped her in from Wisconsin. It was our first Guest via Skype and it worked very well. Catherine taught us how to get our work published which she called “Making Your Mark”. A wonderful presentation on top of her writing talent we learned a lot. She is an informative and amusing instructor. What a wonderful presentation Catherine gave. It was so detailed and amusingly presented. We all learned a lot. She told us that she grew up in the 1960s. Catherine writes mostly creative nonfiction because she doesn’t like to be mean to characters as fiction seems to need. While she waits for a book to be published she concentrates on writing for online and literary publications. Catherine asked each of us what type of things we liked to write about and geared her presentation to meet our needs. It was interesting to see the wide variety of subjects and genres we write: memoires and fantasy to poetry. Then she introduced us to literary journals and where to find them online. She carefully went through how to submit to these journals, using two approaches. She covered formatting and tracking of submissions. Including it was interesting to discuss the differences between print and online journals. To conclude, she talked about the alternative ways to get one’s writing out in public. It is now up to us to get our writings finished and with Catherine’s terrific presentation, we are empowered to find publication avenues we’d never thought of before. As a bonus Catherine set us up with some valuable homework related to her talk. We are each to write our own bio of 50 words. During the opening of our next meeting of Tea & Ink we will discuss and workshop these bios together as a writing group. Finally she added information about other ways to get one’s writing out in the public. Now, I guess, it is up to us to get our writings finished and then get it out there for others to enjoy reading. Thank you, Catherine, for this very enjoyable evening. Summer break being over we now were starting the new year of meetings for creative writing. Author & Poet Michelle Barker was our special guest this month. She was born and raised in Vancouver, travelled a lot for work and pleasure, and ended up back in Vancouver. Michelle was the winner of gold National Magazine award in personal journalism in 2002, and finalist for the TD Canadian Children’s literature Award in 2016. Upon the opening of her presentation about poetry Michelle advised us to bring all the five senses into our writing. Images should not be just visual for the reader. This sounded very challenging, but by the end of the evening one could see (and hear and smell and touch and taste). Of-course, one big step for Tea & Ink members present was to learn more about poetry that doesn’t rhyme. Michelle eased us through by showing us and explaining the formation of “free verse” and we were able to really appreciate it afterwards. Michelle brought two poems with her to demonstrate the way to read a poem out loud. This was an eye-opener to Mo in particular. Sherry read the first one. It was strange to see that this poem wasn’t read by the line, but by the punctuation. It made sense to do that. Natalya read the second poem which right through to the end…and it was one page long…didn’t have any punctuation at all. It was meant to be read without stopping. So very unusual. Following the readings and a discussion about the formation of these two poems Michelle then conducted an activity. We each were instructed to take 10 minutes to write a memory of something. Then we all spilt up into twos. Then we had to take turns reading our mini story whilst our partner jotted down just individual words of note. The follow up would be to write a poem using those notable words. Perhaps our next meeting will start with us listening to these new poems we should have written by then. Interesting! Thank you, Michelle for this very pleasant evening. It was truly great to have you as our guest speaker. Word of our group Tea & Ink has begun to get around and requests are coming in from hopeful new members. Luckily, we still have sufficient seats for everyone. We even Skype in a member now and then. At the March meeting, we welcomed Natalya Patz, student and author, as our special guest. Although she is only a young teen, she already has three published books to her credit. Natalya chose to speak about how to build a fictional character – and that means inventing characters, not just describing their looks. We learned about dreaming up character temperaments, skills, likes, dislikes, strengths, weaknesses and even their weirdnesses. To make it easier for us, Natalya encouraged us to consider three basic aspects for each one from “Write! Shoot! Edit!”: a skill; a weakness; and a quirk. For an activity, to help us absorb the technique, she guided us through a game similar to the game Consequences. We were each given a slip of paper and instructed to invent the name of a character, fold the top of the paper (to hide the name) and pass it to the person beside us. Next, write a skill for the character, fold again, pass again, and add the weakness, fold, pass and then the quirk. Now we had complete character descriptions. After passing the papers around the circle a few times, each of us read out the imaginary, compound character. It was amazing the range of characters we had invented. The game was fun, and we learned a lot, too. Upon closing, Natalya read a passage from one of her published books, and then treated us to a preview of a work in progress: a high action fantasy adventure that swept us away. We are all grateful that Natalya came to speak with us to speak about this important part of creative writing. It was delightful of her to share her talents and to be so encouraging to us in our efforts. At this meeting we were delighted to host Deborah (Deb) Patz, author & filmmaker, as our special guest. She writes guides about movie-making both for professionals working (or aspiring to work) in the film industry and for young adults who dream about one day becoming a filmmaker. Write! Shoot! Edit! A Guide for Teen Filmmakers is published worldwide this summer. Deborah’s presentation was two-fold. She first spoke about what she calls the 3-Headed Approach to Creative Writing, guiding us through the creative process from draft to final copy. In the second part of her presentation she walked us through the 3-Act Structure so commonly used for movie stories. It was insightful to see the traditional peaks and valleys of story and we will never watch a movie the same way again. Deborah closed her presentation with a reading from Write! Shoot! Edit! her latest book and from her unpublished thesis novel of her MFA – a fantasy adventure story for young adults. It was a long session so for the practical part of the evening Deborah conducted a brief session on writing short poetry inspired by objects around us. It was amazing the imagery we each managed to write. The activity sparked our interest to have a poetry meeting in the future. Many thanks go to Deborah for all that she shared. It is an evening we will always remember. At our first meeting we were thrilled to host Darlene Foster, children’s author, as our special guest. She was in town from her home in Spain. She writes a series of books about a 12 year old Canadian girl called Amanda who has many adventures travelling around the world with her parents: Dubai in the United Arab Emirates; Madrid in Spain; London in England; Calgary, Alberta in Canada; and even on a river cruise in Europe. We discussed idea generation for stories. A great topic for our first meeting! Darlene shared with us where she gets the ideas for her stories. She said that when she visits a country, she observes the people around her and when an idea suddenly sparks in her mind she follows it through until a book is formed. She closed her talk with a reading from her most current book. From discussion to practice, we spent thirty minutes dreaming up and writing new ideas. After tea we shared our creations. One lady, who was visiting from the States, wrote a fantastic piece about her elderly mother that left us breathless. It was an honour to have Darlene at our club, embarking us on our writing journeys with professionalism and thorough enjoyment…..Thank you Darlene! 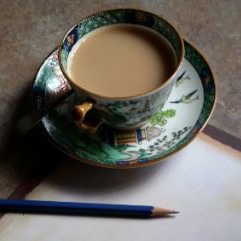 Tea & Ink Writing Club is a group of ladies of all ages who are interested in the enjoyment of creative writing. We hold meetings every other month (for now). Actually we were going to be called Coffee & Ink , but during the first refreshment break no one opted for coffee, only tea. So Tea & Ink we are! Each meeting includes a general discussion of about creative writing that the members of the group might have accomplished prior to our get together and invite a guest speaker to each of our gatherings, if possible.